Are your dreams always in the back of your mind but you're not moving towards achieving them? Feeling unmotivated or uninspired? 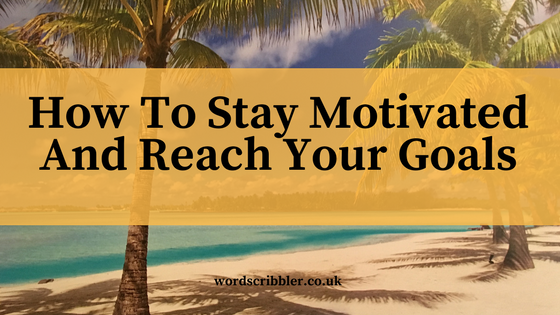 Here are five tips for keeping yourself motivated and reaching your goals, that I use and work for me. 1. Set a goal date. It's great to have big dreams and life goals. Some future goals are so far in the future right now there's no action you can take towards them, but for others there are tangible actions and steps that will help you move closer to your long term and short term goals. What can you realistically achieve in a day or a week? You're not superhuman and super productive every single day. Be realistic with your timescale and don't over plan or over aim, you're likely to fail, get behind and feel overwhelmed. You're not going to complete 10 tasks every day for weeks. Doing something daily is really difficult to maintain and your productivity and motivation can weaken. Aim to complete 1,3 or 5 tasks a week (depending on the size of the goal, date you're aiming for and how many different goals, with different end dates, you're aiming for at once). Write them on your calendar or in your diary. Colour code them if more than 1 goal. Keep progress with a tracker in your notebook or bullet journal. Having a constant or regular visual reminder of your goal is great for inspiration and motivation. One of my goals is to book my dream holiday, an Indian Ocean island paradise trip. My 2017 calendar (that hangs on my wall and I see every single day) is a 'Paradise Beaches' calendar, of beaches and crystal clear water in the Indian Ocean, South Pacific and Caribbean. My laptop wallpaper image is of a hotel in the Seychelles. I also have a secret Pinterest board of images representing my goals, that I see regularly when I am online, and some of my public Pinterest pinboards reflect my goals too, such as 'Paradise' 'Dream Houses' and 'Writing Inspiration'. Do you have images of your goals in your bedroom, work or writing space? A good motivational tool is to focus on what you have achieved so far, not just thinking of all the tasks you still have to complete or goals not yet accomplished. I have a separate notebook, in addition to my diary and to do list, that is my achievement journal. I write down what I have achieved that day. Sometimes these can be really small things (but small things add up to big achievements!) or big tasks completed and ticked off the goal tracker. By having to sit and think and actually write these down brings a real sense of accomplishment and moving forward. I also have an achievement tin. I use an old instant coffee grounds container with a fun and bright pattern on for this! You could use an empty glass jar and decorate it or you can buy a pot with a removable lid especially for this purpose if you wish. Using small pieces of paper, write down the things you have achieved so far, 1 achievement per piece of paper, adding as you achieve goals, and keep them in the tin. Opening the tin regularly and reading one of the great things you have achieved keeps you feeling positive and motivated to keep going. In a similar way, I have a dream tin, with my big dreams and the goals I'm actively working towards. At the start of every week or month, depending on your goal date, re evaluate your goal(s) and your progress. How many tasks are you completing? Have you planned to do too much or too little? Set aside 1 or 2 days a week to not work to recharge your body and your brain. Keep an eye on your goals but also make sure you schedule time off, whether it's 1 day a week or 1 week a month, when you don't plan any tasks and you'll come back to it feeling refreshed and positive. Reward yourself for achieving your goal(s) for that week. The weekly to do list you originally planned is subject to change and not set in stone. If you really need a weeks break, because of other priorities or life just getting in the way, then that's totally fine, and this can be beneficial as gives your thoughts a break and when you think up new ideas. Whilst it's good to push yourself to reach deadlines you've set for yourself, also keep your workload realistic and if your 1 year goal becomes a 1 year and 2 month goal, that's ok! Remember - Slow is better than standing still. Late is better than never. If you get behind, if you take a few more months to reach your goals, you still achieved them! Better than never starting or giving up. What do you do to motivate yourself? Do you have visual inspiration around you? How do you track your progress? Do you celebrate what you've already achieved?